Author’s name: Ryan L. Kobrick, Ph.D., MDRS Crew 188 Commander Mission Status: Crew is well. I think it goes without saying that our crew made many sacrifices to be a part of this two-week experience (finances, family, work, and much more). One that may not be obvious, and would have been impossible to time, was missing the Falcon Heavy historic launch. The unquestionable highlight for today was SpaceX’s success launch and landings, and what that may mean for future human spaceflight exploration. Today was packed with exploration. Two EVAs including a beautifully choreographed performance optimizing a 360 camera, and a driving excursion to uncharted territory. The crew was able to watch the launch and twin landings in a video later in the evening. Wow. Even watching the launch delayed had a similar impact to being there with family and friends in Florida. It was rocket-eye-candy-overload. Who knows when the next FH launch will be, or where any of us may be located, but we do know that these are the ingredients needed to make a mission to Mars feasible. Tomorrow solar observations will continue in the morning hoping for calmer weather. An afternoon EVA will celebrate our international diversity and the upcoming Olympic Games with our own Martian Olympiad. The temperatures are cooling off and the winds remain high. 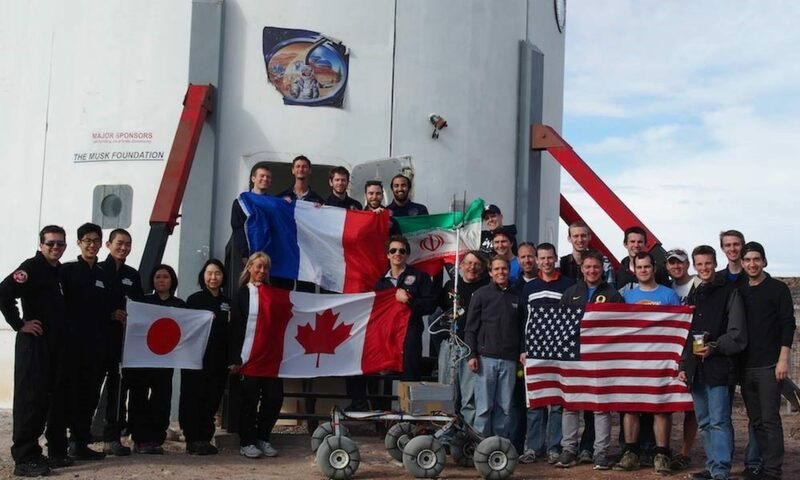 The crew has been burning on full throttle from 8am until 11pm and pushing hard to the finish line to be fully successful in their scientific and artistic investigations at MDRS. – Vegetables were requested due to the insufficient supply for six crewmembers. Non-vegetarians have cut their personal rations to help stretch the supplies for the two vegetarians. We have two celiac members who cannot eat the starches provided. These diets were all communicated before our arrival. In order to feed crewmembers over the next 4 days, 2-3 cans of dried vegetables were requested (or fresh) with the missing items from the original food supply. We were informed today that we will not be getting any form of resupply. Susan Holden Martin suggested we reiterate this request to mission support since it remains open. – Our reports have not been posted to the MDRS website since Saturday Feb 3rd. Please check the status of these documents for dissemination. We did see some photos on Facebook.